I live for travel, it’s my muse! There’s no form of travel I love more than adventure travel. Yet, when it comes to planning trips, I’ve additional challenges to consider. That’s because I’m among the 96% of individuals with chronic medical conditions not requiring a medical device, also known as invisible disability. My struggle with chronic illness has been a long road to understanding, acceptance, and adaptation. Meanwhile, I’ve come to realize that just because I live with an invisible disability doesn’t mean I can’t pursue my passion! Tall and fit, it’d be impossible to know that Tim has diabetes based on appearance alone. Yet, he struggles with physical limitations, some of which impede on his ability to reach with his hands and secure footholds. This hasn’t discouraged Tim from pursuing adventure travel. In fact, his favorite activities include trekking, cycling, rafting, and diving. Like Tim, I look perfectly healthy on the outside. Meanwhile, I struggle with autoimmune disease and a vestibular disorder, along with the long list of acronyms and abbreviations doctors used to categorize my symptoms. This isn’t uncommon for people with compromised immune systems, who are more susceptible to infections and get sick more frequently than healthy individuals. In order to adapt, I’ve learned to forego unrealistic expectations imposed by society. I no longer compare my abilities to others. Instead, I set goals that account for the added hurdles. If I don’t cross the finish line, that’s alright! I can take pride in trying. After all, life is about the journey and not the destination! 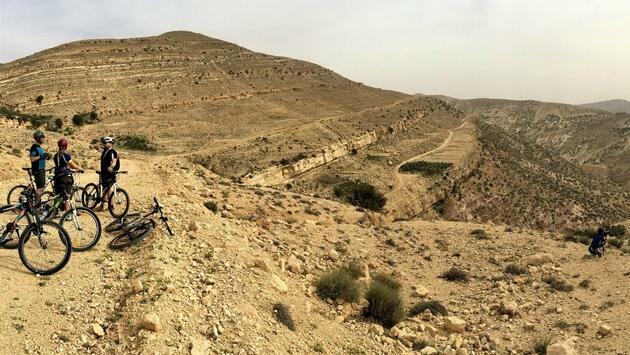 That’s why I was excited to join a cycling tour in conjunction with AdventureNEXT: Near East. 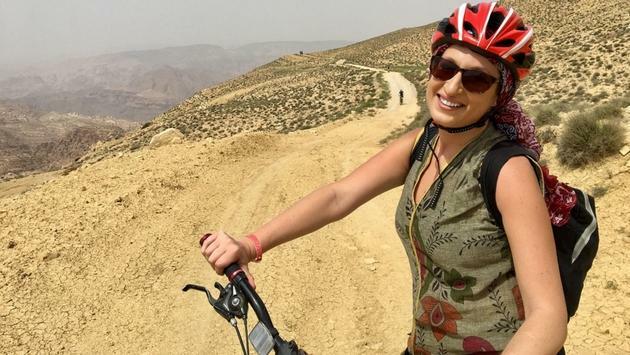 An avid street cyclist, I hadn’t any experience mountain biking, so I looked forward to traveling to Jordan to engage in a new activity with Terhaal Adventures! I was also conscious of how important it is for the people I travel with to be aware of my health condition. Due to the unseen nature of a hidden disability, it’s especially crucial for those leading tours to have this knowledge so they can provide accommodations without negatively impacting the experience for other participants. It’s always a good idea to discuss these concerns in advance in order to confirm that the tour will be able to provide these facilities. It’s also important they provide guides with the experience and flexibility to make adjustments so everyone can enjoy. Furthermore, travelers with a hidden disability should also practice self-care in conjunction with advocating for inclusion. “As I get more experienced, I'm better able to take care of myself,” comments Tim, adding that he sometimes needs more time than the others to build confidence. I believe this confidence can be constructed from honesty and communication, which comes to the forefront of my mind during Invisible Disabilities Awareness Week. We must be conscious that people with a hidden illness often have to work twice as hard to accomplish half as much. That’s why we must acknowledge one another’s accomplishments, no matter how small or large they may seem. Personally, I’m up for the challenge vested by my belief that nothing worth doing will ever be easy. There’s always the temptation to hide behind a cloak of invisibility and pretend the challenges of my health don’t exist. This strategy has always been the surest path to failure. That’s why for some, achieving greatness might mean allowing ourselves permission to redefine the meaning of “success”. In the many years it has taken to come to terms with my illness, I’ve learned that by listening to my body and communicating with others, it’s possible to realize my potential within my own means. So in keeping up with this communication, I made sure that others participating in my cycling tour were aware of my hidden disability. That way, if I experienced sudden illness during our tour, they’d know what was happening and that they could continue without having to pause for unnecessary concern. Then again, for those with an invisible illness, communicating can be cause for concern in itself. Beyond the immediate burden of our health, we must also navigate the social obstacles of judgment, stigma, and retaliation. There’s always the worry that by admitting to chronic illness, we’ll be denied opportunities and rejected by our peers. All too often, these concerns are validated. I could write an encyclopedia describing the social repercussions I’ve experienced as a result of my hidden disability. Yet, I believe much of this difficulty derives from the general lack of awareness, which serves as an impetus for misunderstanding. That’s why I was encouraged when travel journalist Aaron H. Bible approached me before our cycling tour to ask about my autoimmune disease. Beyond the often comedic portrayal in popular culture, Aaron was unfamiliar with narcolepsy and wanted to learn more! His inquiry was welcomed because it was void of unsolicited advice (i.e. he asked questions that didn’t start with, “have you tried”). It was refreshing to know my honesty had created an opportunity to educate and challenge the stereotypes. Since speaking more openly about my invisible illness, I’ve found that more often than not, people are receptive. This conversation bridges the gap towards mutual respect, which in essence, connects the road to compassion and understanding. There’s no denying the bonds we created while cycling in Jordan were inspiring. Our tour started within the Dana Biosphere Reserve, where we traversed a path to Little Petra. Every few miles we stopped to appreciate the stunning landscape, encounter camels, and gaze upon the ruins of ancient civilizations. We were cycling downhill through a local village when my condition flared up and I began to feel dizzy. It was the onset of vertigo, one of the most debilitating setbacks I commonly experience as a result of Meniere’s disease. Before I knew it, Tim was riding alongside me as we trailed behind. He encouraged me to push myself as far as I was willing to go. Then, we called upon our guides for assistance so I could ride in the support car escorting our tour until the spinning subsided. These friendships are what enable Tim and I to travel around the world. Our participation in these tours relies on our willingness to discuss the challenges of invisible illness, which inevitably opens the door to a network of camaraderie and support. Perhaps the adventure travel community is unique because we like to push ourselves farther while inspiring one another to take on challenges! No matter what moves you, it’s important to remember that everyone—regardless of ability or disability—as dreams and aspirations. “At the end, they are here to enjoy [it to] the max!” says Aref, who encourages anyone comfortable with riding a bicycle to sign up for a cycling tour. He thinks it’s a wonderful way to gain perspective while exploring the spectacular scenery of Jordan. For those who are unable to go cycling or travel to another country, there are even more ways to discover and explore! It’s perfectly normal to feel anxious about travel and adventure. Then again, what is normal? The interpretation of trying something new may vary, especially for those with disabilities, which occur on a spectrum. For some, adventure may mean visiting a friend in another city, patronizing a business in their own neighborhood, or perhaps trying a new craft or creative project at home. For me, flying halfway around the world to try extreme sports—whether it’s cycling in Jordan or scuba diving in Australia—is adventure. It’s also a challenge! Despite my struggle with invisible illness, I’ll never give up on my passion nor will I deny myself the right to take pride in these endeavors. I may not be normal, but I wouldn’t have it any other way.